The California Department Real Estate website can be found here www.dre.ca.gov . The site has information about the salesperson and Broker real estate exams, most of which, you can find summarized below. Taking the California real estate exam must be done at one of the five main offices in California. You may find it easiest to schedule your real estate exam date online. If you would like to schedule the exam by phone, you can call one of the main California real estate offices and they will assist you. You must be at least 18 years of age to take the California real estate exam. You must also live in and be a citizen of the United States. If you live outside of California, there may be additional requirements that you will have to fulfill before you can be licensed. Licensed real estate agents must be honest people. If you have been convicted of crimes in the past, you may not be eligible for a real estate license in California. You must disclose on your real estate license application any crimes of which you have been convicted. Before taking the real estate sales person exam, applicants must complete and pass the Real Estate Principles Course, the Real Estate Practice course, and one other real estate course of your choice. A list of the courses available can be found on the California Department Real Estate website linked above. 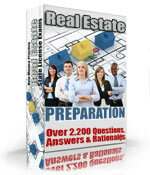 The California salesperson real estate exam contains 150 multiple choice real estate questions. You are given 3 hours and 15 minutes to complete the exam. You must answer 70% or more of the questions correctly (105 questions answered correctly). You are permitted one simple function calculator that may be inspected by the real estate exam proctor. The CA real estate exam is closed book so no notes or books may be used to complete the exam. You are given blank paper to calculate math questions, this paper must be turned in after you complete the real estate exam. Cell phones are permitted, but must be turned off in the exam room. Examinees are allowed to use the restroom one at a time. If you are suspected of or are caught cheating, you automatically fail the exam. The fee to take the real estate salesperson exam is $25. Your exam results can be obtained five days after it has been completed by calling the licensing automated system at (916) 227-0899. • Eat a balanced diet before the test and drink plenty of water. Eat foods that are rich in B vitamins like bananas, oatmeal, and raisins. • Get plenty of rest before the real estate exam and Do NOT cram. If you don't know the information to pass the California real estate exam the night before the test, you will not likely know it for your exam the next day. Relax or sleep instead of cramming. • Do not drink a large quantity of caffeine before the exam. Coffee and eating candy or sugary foods before the exam will contribute to your test taking anxiety. This will interfere with your cognitive processes. • Study regularly over a period of weeks before your real estate exam. Even consider skipping a study session on the night prior to the exam. • Know exactly where the California Real Estate Exam office is and arrive early to reduce anxiety and the probability of being late. Remember that you have to be signed up for the exam. You cannot just walk in and take the exam. Bring two pieces of ID. At least one should be government issued, like a driver's license or a passport. • Remember to bring a simple functioning calculator. There will be some math questions on the exam, so be prepared. • Also, remember to bring your exam admittance notice that should be mailed to you by the DRE after you register for the exam. Having this notice makes the identification process easier. • When you go to take the real estate exam, dress in multiple layers so that you can shed what you do not need and still be comfortable. Temperatures of the offices can vary a great deal throughout the day. • Use the restroom before the exam. You are allowed to go during the exam, but take care of it sooner than later. You will be required to take one form of ID with you while the other stays within the exam room. It may be verified each time to leave and enter. • You must bring two forms of ID to the exam site. At least one with a photo ID. • DO NOT get hung up and waste time on individual questions. Answer the questions you know first, then use time left over at the end of the exam for answering the more difficult questions. • DO answer every question. By not answering a question you are guaranteed a wrong answer. Remember, you need to answer 105 questions correctly out of 150 to pass (70%). Use the process of elimination to take your best shot on questions you are unsure of, these questions may mean a big difference on your final score. • Be careful of wording and look for words like EXCEPT, ALWAYS, NEVER, MOST APPROPRIATE, and other qualifier words. Look out for any wording that puts limits on the potential answer. • Read the whole question thoroughly at least a couple of times and formulate the answer in your head BEFORE you look at the answer choices. If you look at the answer choices prior to understanding the question completely, you can be lead to choose an incorrect answer. • There are 4 potential answers. Two of them can usually be eliminated right away after reading the question a couple of times. Now you just have to decide the "best" choice between the two remaining answers. • Do not complicate the scenario or situation. Do not bring elements into the questions that are not there. This will cause you to overlook the basics, which is probably what the question is testing for. • Relax, remember to breath adequately.